It is crucial to protect our pets on hot summer days. Dogs and cats don’t sweat the way people do, and they are very sensitive to heat. So it’s important to keep an eye out for signs of discomfort or stress when your pet is in a hot environment. For instance, an animal can quickly overheat in the car. It can take only minutes for a dog to die in a hot car. If you are driving around town, consider leaving your dog at home, especially if you have to leave them in your vehicle while you run errands. When the air temperature outside is 75 degrees, the temperature in your car is 118 degrees (without air conditioning). When it’s 90 degrees outside, it can quickly reach 143 degrees in your car. 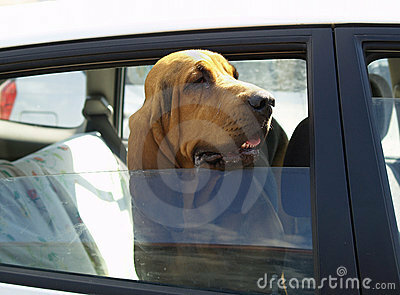 Even rolling down your car window slightly will not keep the inside of your vehicle cool enough for your dog. Going for a ride with the family, and with the air conditioner running, is fine, but remember – if you have to exit your car to do errands, leave Fido at home. Another source of discomfort for dogs is walking on hot asphalt. When it’s 77 degrees outside, the temperature of asphalt is 125 degrees. And when the air temperature is 87 degrees, asphalt can be 143 degrees – which is hotter than it takes to fry an egg! If I’m wearing flip-flops or other slip-off shoes, I just put my feet on the pavement I’m walking my dog on to check how intense the heat is. You can also place your palm down on asphalt and check that way too. If it is too hot for you, it is too hot for your dog’s feet. Always keep fresh cool water available for your animals. Placing a drop or two of therapeutic grade Peppermint oil in your animal’s water can help cool them internally. I do this for my dog’s water and also for my horse’s water buckets. 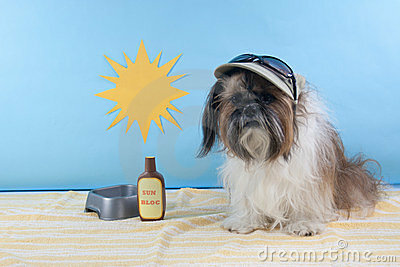 Pets can get sunburned just like people do. If you have your dog shaved in the summertime, especially if your dog is light or white in color, avoid direct sun. For horses or dogs that have pink or white muzzles or noses, you can use a children’s sunblock to safely and effectively avoid a burn. Just rub a little bit on their nose or muzzle daily. Make sure that your outdoor pets have access to shade as well, so they can give themselves relief from the sun. My horses are not stalled, but we do have an in-and-out for them, and a section of paddock with lots of shade trees. There’s a significant temperature difference just by stepping into the shade. If your dog has to stay outdoors, please be certain that they have plenty of shade cover, and always provide fresh, cool water several times a day. Another good cooling tip is to fill up a plastic kiddie pool for your dog to lay in or splash around in. It’s a great way for them to enjoy some safe summertime fun! Written by: Brenda M. Tobin-Flood, Cert. C.N.